This tweet came in response to yesterday's daily update lead story, written by Dave Meltzer, that criticized Coachmen for "speaking without thinking" about the realities of the compensation given to ex-wrestlers from Vince McMahon and WWE after they retire from the ring. Currently WWE is being sued by 53 former performers for compensation due to injuries suffered while working for WWE. Coachmen was speaking on ESPN in defense of WWE. ​If you've ever wanted to WATCH our radio shows here on the site, check out our Youtube page! No full video shows, but lots of video clips, full free audio shows that you can tell your friends about, and much more to come! Make sure you subscribe today! READ IT HERE: Figure Four Weekly 7/18/2016: Does WWE policy apply to Brock Lesnar? - The latest big pro wrestling/mixed martial arts hybrid story involving Brock Lesnar saw him flagged by the United States Anti-Doping Association (USADA) for a potential anti-doping violation in an out of competition test collected on June 28. The results came in on the evening of July 14th and the UFC was notified the following day. Subscribers click here to continue reading. READ IT HERE: July 25, 2016 Wrestling Observer Newsletter: Results of the WWE draft, Brock Lesnar fails USADA drug tests, - The WWE draft ended up just as planned from the start, with the same dynamics of Roman Reigns vs. Seth Rollins as the top Raw program and John Cena vs. A.J. Styles as the top Smackdown program. With one of the biggest news weeks of the year, it's a double issue of the Observer this week, covering the draft, the Jon Jones & Brock Lesnar drug test failures and drugs failed for, the Roman Reigns drug test failure, a major WWE star who is no longer under contract, lots more on the UFC sale, details on the latest concussion lawsuit against WWE, as well as coverage of the beginning of the G-1 tournament and the beginning of the Super J Cup. The lead story covers the draft. We look at what, when the draft idea started, were the planned main events for SummerSlam. We look at what did and didn't change about the draft and why. We look at what failed about the draft. We look at what changed in the final week before the draft. We look at why certain people were called up from NXT and some interesting decisions made. We look at the situation with he cruiserweight, the announcing team changes, and what's new with Brock Lesnar. We've got a complete rundown of not only who is on what brand but slotting and what the slotting shows, as well as the Cesaro interview. We also go through the Jon Jones and Brock Lesnar drug test failures. We talk about the drugs, what their medical usage would be for, Jones past test results and Twitter responses. We also look at what Lesnar tested for, Mark Hunt's reaction, what punishment Lesnar is facing, and how this pertains to pro wrestling. We also look at what John Cena said about the test failure. We've got more on the UFC sale including several other companies that had interest in buying UFC and why each one ended up dropping out as the bidding reached high points. We look at what different stations had wanted to do with UFC, and why a media company would have made sense as a buyer. We look at what revenue stream and logic was used to generate the $4 billion sale figure, as well as notes on Dana White and Lorenzo Fertitta after the sale. For the United States, it is $13 for 4 issues, $32 for 12, $61 for 24, $101 for 40 and $131 for 52. In Canada and Mexico, rates are $14.50 for 4, $35 for 12, $67 for 24, $111 for 40 and $144 or 52. In Europe, you can get the fastest delivery and best rates by sending to moonsault@mediaplusint.com. For the rest of the world, rates are $16.50 for 4, $44 for 12, $85 for 24, $141 for 40 issues and $183 for 52. If you are a new subscriber ordering 24 or more issues, you can get one free classic issue of your choice sent to you today. With a 40-issue subscription, you can get two free classic issues. READ IT HERE: June 14, 1999 Wrestling Observer Newsletter: Sable sues WWF for $140M, Martha Hart upset with WWE - Pro wrestling's latest spill into the national headlines came with Rena Mero's $140 million lawsuit filed on 6/3 against Titan Sports and her subsequent quitting of the company. Patrick Laprade interviewed our Dave Meltzer in advance of Dave receiving the Jim Melby award at the National Wrestling Hall of Fame in Waterloo, IA, this weekend. Katsuyori Shibata vs. Kyle O’Reilly and The Motor City Machine Guns, Lio Rush, & ACH vs. The Young Bucks, Yujiro Takahashi, & Hangman Page have been announced for ROH’s August 27th Field of Honor show at MCU Park in Brooklyn, NY. Ring of Honor also released the locations for their UK tour on November 18-20. Actual Booty O’s cereal is now available for pre-order. 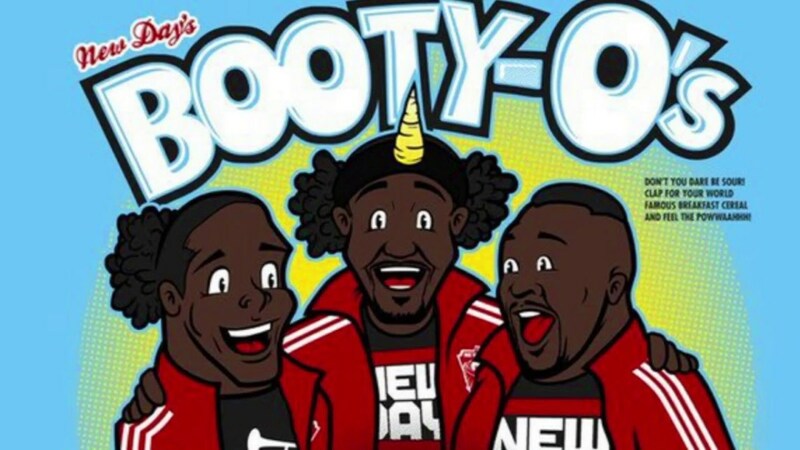 The New Day announced the cereal at San Diego Comic-Con yesterday. Former Bellator light middleweight champion Alexander Shlemenko had his three-year suspension and $10,000 fine for a PED failure rescinded by the California Superior Court. Because his fighting license expired on February 28th, the court ruled he could only be suspended until that date. He will still have to pay a $5,000 fine for the test failure and his suspension will be lifted once he’s paid that fine. He has fought twice overseas since his suspension was announced and will be eligible to have his license reinstated once the fine has been paid. William Regal tweeted a story about Cruiserweight Classic competitor Kenneth Johnson overcoming a speech impediment to become a capable promo. Eva Marie will be a judge for this year’s Miss Teen USA competition. Johnny Gargano will work his final show for EVOLVE on September 11th in Queens, NY. And his final independent match before becoming a full member of the NXT roster will be on September 23rd for hometown promotion AIW in Cleveland, OH. EVOLVE released a mini-doc about Gargano’s farewell yesterday. New Japan Pro Wrestling will run joint shows with Revolution Pro Wrestling in the United Kingdom on November 10th at York Hall in London and on November 11th at Walthamstow Assembly Hall in London. UFC lightweight champion Eddie Alvarez said that he wants to face the winner of the Conor McGregor vs. Nate Diaz fight. Ray Borg is out of his fight with Freddy Serrano at UFC 201 due to injury. Stepping in will be Ryan Benoit, who has lost two of his three UFC fights. Colby Covington vs. the debuting Max Griffin has been added to UFC 202. A women’s bantamweight fight between Germaine de Randamie (6-3) and Ashlee Evans-Smith (4-1) has been added to the UFC Hamburg show on September 3rd. De Randamie had been rumoured to be a potential opponent for Cris Cyborg. Two unbeaten lightweights will square off at next month’s UFC on FOX show from Vancouver as Josh Emmett (10-0) takes on Canadian Jeremy Kennedy (8-0), who is making his UFC debut. Video of the weigh-ins for tonight’s Bellator: 159 show featuring Darrion Caldwell vs. Joe Taimanglo have been uploaded to Bellator’s YouTube channel. Paul Fontaine has a preview of the show up here. Bayley appeared on the latest episode of Chris Jericho’s podcast. On the latest episode of the Boy Meets World podcast, they talk about the very pro wrestling-centric episode in which Vader makes his first of many appearances on the series. TONIGHT - The Lou Thesz Hall of Fame weekend show in Waterloo, IA, featuring Ricochet vs. Sami Callihan, Wes Brisco, B. Brian Blair, Jessika Havok, Tessa Blanchard, a steel cage match and more - This is the weekend Dave Meltzer will be honored. July 23 - UFC on FOX from Chicago - Holly Holm vs Valentina Shevchenko. July 23 - Chikara Pro announced a doubleheader event at Toronto’s Franklin Horner Community Center. July 23 - AAW in Merrionnette Park, IL, with Sami Callihan vs. Pentagon Jr., Zack Sabre Jr., Marty Scurll; Tommaso Ciampa; Fenix; Johnny Gargano, and plenty more. Here’s what you missed on their last show. July 24 - WWE presents Battle Ground PPV at the Verizon Center in Washington, D.C. It will be the fourth event under the Battleground chronology, and the first event under the newly reinstated WWE brand extension. July 24 - Crossfire Wrestling - Merritton Community Centre, 7 Park Avenue St. Catharines ON, for our 5 year Anniversary show "BRING THE HEAT V"
Aug 4-6 - !BANG! TV - Professional Wrestling Spectacular, 3 charity shows in 3 days. - More information. Aug 5 - NEF Presents Dana White: Looking for a Fight. More info here. August 6 - Absolute Intense Wrestling Girls Night Out in Cleveland at Our Lady of Mt Carmel with Crazy Mary Dobson, Allysin "Sienna" Kay, Veda Scott, Shayna Baszler, Annie Social, Kelly Klein, Heidi Lovelace, Lufisto, Nicole Savoy and more. Aug 12 - Live Professional Wrestling, downtown Toronto at the Tranzac! 292 Brunswick Ave, Toronto, ON M5S 2M7, Canada - All proceeds go to the Autism Ontario group. Aug 12 - Zack Sabre Jr. vs.. Jeff Cobb has been added to the Revolution Pro show in London at York Hall in Bethnal Green. Aug 13 - NWA Mid South Wrestling in Dyresburg, TN at the Herb Welch Wrestle Plex headlined by Matt Riviera vs. Jeremy Moore. Aug 19 - The Hardys, Drew Galloway, Ethan Carter III and Mickie James appear for House of Glory Wrestling in Jamaica, NY. That's the Friday before SummerSlam. Aug 21 - WWE Presents THE SummerSlam PPV event at the Barclays Center in Brooklyn, New York. It will be the twenty-ninth event under the SummerSlam chronology and the second consecutive SummerSlam to be hosted in the Barclays Center. Aug 21 - Chavo Guerrero Jr. will appear for Smash Wrestling on in Pickering, Ontario at Super Showdown lV. Aug 21 - Octagon & Tinieblas Jr. vs. Fuerza Guerrera & Pirata Morgan headlines in Houston at the Arena Theater. Aug 26 - CONFLICT Wrestling: "Black or White"
Aug 27 - UFC FIGHT NIGHT - MAIA VS. CONDIT from Vancouver, BC. I’m already pumped. Aug 28 - Destiny wrestling proudly presents “SUMMER HEAT”. Friday Famous B 2:15 p.m. to 4 p.m.
Saturday Johnny Mundo 1 p.m. to 3 p.m.
Saturday Taya 1 p.m. to 3 p.m.
Saturday Frankie Kazarian 3:15 p.m. to 7 p.m.
Saturday Christopher Daniels 3:15 p.m. to 7 p.m.
Sunday Lisa Varon 11 a.m. to 2 p.m.